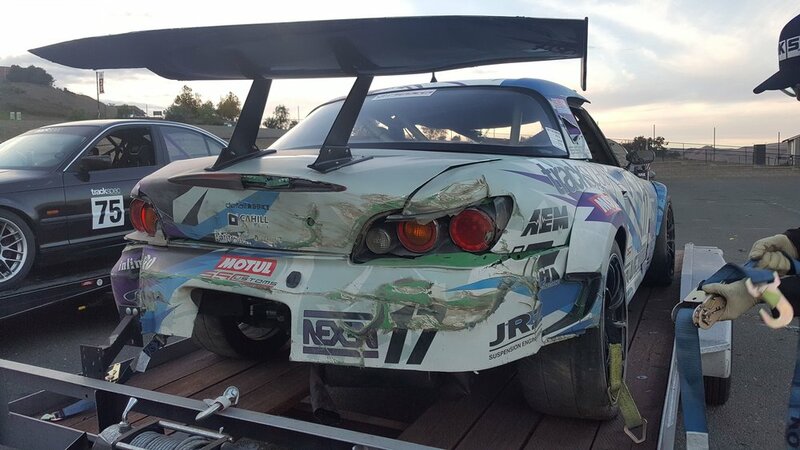 This event marked our second attempt at the Sonoma 4-hour enduro, part of the NASA Western Endurance Racing Championship series (also known as WERC). Last year, we attempted to run this race with 2 cars (my ST4 Honda S2000 and Liam’s ST4 Honda Civic). Unfortunately, both cars had to retire early because of parts failures. I broke two differentials (my main and my spare) and Liam lost a gearbox. Click here to revisit that weekend. Well, needless to say we learned from last year’s experience and showed up with much better preparation. We also decided to field a total of 3 cars this time around: Martin’s ST4 Honda S2000, my ST4 Honda S2000, and Liam’s ST4 Honda Civic. All 3 cars were classified in E0 class under NASA’s endurance racing rules. This also meant that we were in the same class as much faster ST3 cars, which are also considered E0. Martin’s S2000 was piloted by himself, his dad (Willy), and his cousin (Juan). Graham and Liam piloted the Civic together. And as for “Irene,” we decided I would be sharing driving duties with Jon, who ended up getting his provisional wheel-to-wheel racing license that very same morning. Congratulations! Saturday’s schedule consisted of an enduro warm up, the enduro driver & team meeting, and then the race was from 2pm-6pm. Based on fuel consumption and the fact that none of our cars were really setup for endurance, we opted for a 3-stop strategy. This meant a driver change for Martin’s car each time since they had 3 drivers. For Liam it meant a double stint on his part, and then Graham also ran a double stint to finish the race. Given that this was a weekend of many firsts for Jon (first time at Sonoma, first time getting his license, first time driving “Irene” at speed, and first wheel to wheel race) we decided that I would drive 2.5 stints. So I drove for the first 2 hours and 20 minutes (stopping for fuel once), Jon did 1 hour and 20 minutes, and after he pitted again for fuel I jumped in to drive the final 20 minutes at sprint pace. In total, we completed 110 laps; finishing 9th in class (in front of Liam and right behind Martin) and 19th overall. We were really happy about the results because all 3 cars started and finished the race with no issues or incidents. I think we were all really proud of each other, especially Jon for getting his provisional and getting his first race signed off. It was so much fun, and a great preview of what’s to come next year as we think about a combined 25-hour effort. Sunday was an important day for several reasons. Given that the endurance race was the day before, all of the final regional championship points-bearing races took place on Sunday. This meant that Spec Miata had 3 races (Graham finished 4th, 2nd, and 1st) and we had 2 races in ST4. The races were also double points, so it was really important that everyone finished well in order to have a chance at the season podium. We went into the weekend sitting 5th overall, and I was hoping to move up a position (or even two) assuming I drove well. The second ST4 race was at 5pm and Liam had gotten off to a great start. He got around myself and Martin before T4, but after a lap I was able to close the gap. I got a good run on him coming into and out of the Carousel (T6) and passed him going into T7. As I came around T8, I made the mistake of using too much curbing on the left, which upset the balance of the car at 92+mph (this is a very high speed section of the course). The front of the car lifted, and the back end stepped out. I tried to catch it, but I wasn’t able to. After a fast tank slap (left-right slide) I ended up heading backwards towards the tire barrier. When the car hit the barrier, the energy rebounded from the tires and launched me into the air. Combined with the momentum and direction I was already headed in, I wound up flipping over onto my roof. As soon as the car came to a stop, I could hear Drew yelling at me on the radio; anxious to see if I was okay. I let him know that yes, I was okay, that I was upside down, and that I was going to try and get out (you’ll hear this in the video). I was fairly certain the car wasn’t on fire, but there was so much dust/dirt swirling around it was hard to be 100% certain. As such, my goal was to get out and over to the other side of the wall as quickly as possible. I remember watching movies where a car ends up upside down, and then when the passenger releases their seatbelt they fall onto their face. I knew I didn’t want to do that. So after I shut off my kill-switch and removed my steering wheel and window net, I braced myself on my roll cage before unlocking my 6-point harness. Then, I slowly lowered myself onto the ground. I opened my door and kicked it out (it’s designed to come off). Just as I began to slide myself out, NASA fire rescue arrived to help pull me out. They made me lay down first to assess for any serious injuries, then after a few minutes they sat me up. They asked me a lot of questions about my name, did I know where I was, what day was it, etc. as part of their concussion protocol. All the while, two safety trucks were blocking my car and where we were sitting as the race continued under full-course yellow. Damn. I wrecked my car. I wonder if it’s fixable? Moments later, fire rescue flipped my car rightside up and then towed it on a flatbed up to our pit area. I rode along in one of the trucks and saw that an ambulance was waiting for me when we arrived. The paramedics then took over and proceeded to check me out again. They gave me some ice packs and insisted I go to the hospital if I feel dizzy or any worse. I assured them that I was alright, but that yes I would go to the hospital otherwise. I figured, no need to be a hero. After some hugs, maybe a punch on the arm by Victoria for scaring the crap out of her, and sharing of these details above with my team we got ready to head home. I do want to mention that it was really nice to have so many NASA officials, fellow competitors, and other friends stop by to check on me while we were loading up. Also, after briefly posting what happened on Instagram on the drive home my phone was basically non-stop for the next 24 hours with people commenting, calling, texting, and reaching out to see how I was doing. As most of you know, my preference is not to be the center of attention but that made me feel very blessed and cared for. Thank you to everyone who took the time to connect with me. It really means a lot. While I want to say I’m lucky to be alive and also very lucky that I wasn’t more seriously injured, my being here to write about what happened goes beyond just luck. “Irene” has always been very well built from a safety perspective, with no expense spared when it came to the roll cage/chassis (by Doug/Chris/Nate at CT Engineering), the seat/harness/neck restraint combo (Recaro SPG halo, Safecraft, and HANS), and the advanced Safecraft electronic fire suppression system (with its own power unit) that will activate if the driver is unable to. If you get one thing out of reading this, it’s to never ever skimp on safety gear. Trust me, it’s worth it! So, what’s next? We are already in the process of taking “Irene” apart to assess the damage and decide if it is possible and/or if she worth fixing. If not, we need to decide what to do with the parts that are still in good condition. Do we sell them or transfer them into another car? Do we build another S2000, or something new entirely? It all depends on where we decide to focus for next year; which class(es) and what event(s). With that being said, knowing my team, whatever comes next will be bigger and better in 2019. Stay tuned for what lies ahead during this winter off-season.